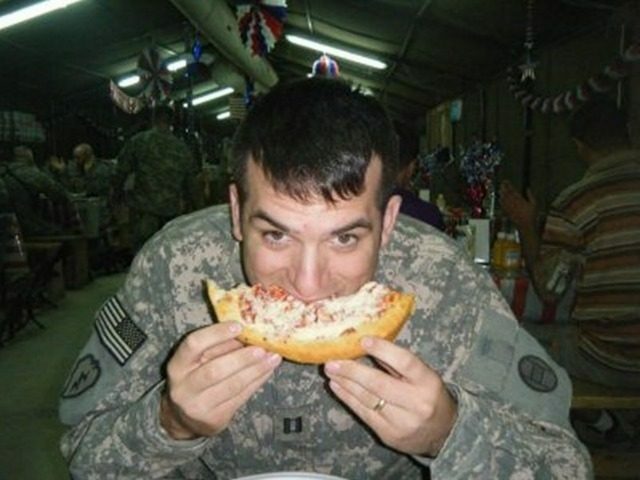 A veteran is sending pizza to U.S. troops deployed overseas just in time for Super Bowl Sunday. Retired Air Force Master Sgt. Mark Evans is the mastermind behind the nonprofit Pizzas4Patriots, which helps provide service members, veterans, and first responders feel at home with America’s favorite comfort food while they are away from home, Fox News reported. Evans, who is based in the Chicago suburbs, said he came up with the idea eight years ago on Fourth of July while he was eating pizza and watching the news with his son. Evans reached out to General David Petraeus and explained how he wanted to send 2,000 pizzas to Iraq. It wasn’t long after that that he began sending the pizzas overseas. Since then, Evans’s group sends pizzas to troops every Independence Day and Super Bowl Sunday. The group has sent 170,000 pizzas across the Atlantic since 2008. The pies are shipped half-baked and flown to the troops by private helicopters. The soldiers come up with creative ways of heating up the food. Air Force Reserve Captain Tommy Holewinski remembers sharing one of those pizzas with a few marines on his base and using a Humvee engine to heat up the pizzas. “The pizza is a big reminder of that life you left behind,” Holewinski said to CBS Chicago. This year, 800 Pizzeria Uno pies are being shipped to Bagram Air Force Base in Afghanistan in time for Sunday’s Super Bowl game between the New England Patriots and the Atlanta Falcons. “I just like to see smiles on soldier’s faces and the stories I hear are incredible,” Evans said.